An ad for Sky's broadband service highlights the upcoming Toy Story of Terror release in the United Kingdom. Although the majority of the footage is specifically for advertisement purposes, we loved the introductory black and white footage with the traditional horror movie fonts and overall feel. Based on the initial plot points we already know, it made us wonder if the black and white footage will be reminiscent of the horror movie that the Toy Story gang will be watching in the trunk of the car on their way to Bonnie's Grandmother's house. 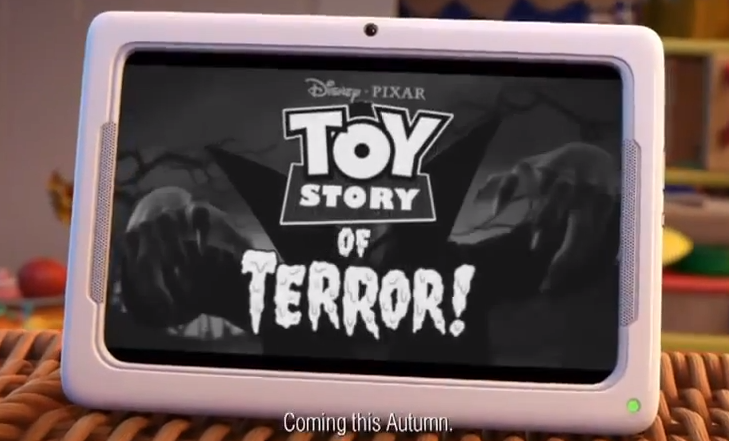 In the video uploaded by A113Animation, we were also pleased to see details that Toy Story of Terror will be released around the same time (Autumn release) as the October 16 North American release (since some of our international readers have inquired about this). - Who voiced Woody in the UK Broadband advertisement?